Newlyweds Miles and Christine Takiguchi held their wedding ceremony and reception at the location where they first met. 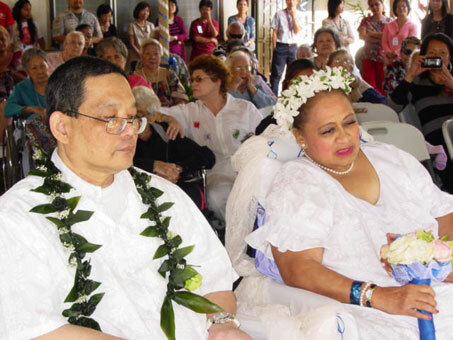 This was the first wedding to be held at Leahi Hospital on Friday, March 30, 2012, at 10:00 a.m. Miles met Christine several years ago, and soon after he knew that they had a lot in common, particularly at keeping their minds busy. Christine remembers Miles as always being cheerful and someone pleasant to talk to, which in turn, kept her focused and prepared to change and adjust.